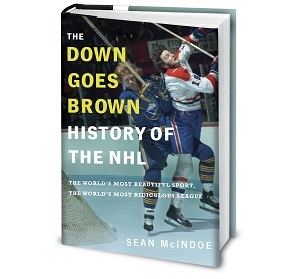 Down Goes Brown: This Blue Jackets thing can't last... or can it? Without question, the Columbus Blue Jackets have been one of the season’s best stories. Coming off of a disastrous year and with virtually nobody picking them to even make the playoffs, the Blue Jackets have exceeded all expectations while contending for first place in the Metro Division. The power play is smoking, the goaltending is excellent, John Tortorella looks like the Jack Adams favorite, and the Blue Jackets are the hottest team in the league today, winning nine straight and counting. After years of misery, fans in Columbus finally have something to cheer about. It’s too bad it can’t last. I mean, it can’t… right? These are still the Blue Jackets. Seeing them beat up the Canadiens and run right alongside the Penguins and Rangers has been fun, but eventually things will go back to normal and they’ll fall out of contention. Of course, plenty of us have been saying that for most of the season, and it hasn't happened yet. If anything, the Blue Jackets are getting better as the year wears on. So today, let's try to get this settled once and for all. Let's lay out the case against the Blue Jackets—all the reasons why this can't be the real thing and their crash back to mediocrity is inevitable. And then let's pick that case apart and see if it actually holds up. Let's start with an area where the Blue Jackets aren't just good, but historically good. They're not for real because: Their power play is too good to be true. Literally. Plenty of things have been going right for the Blue Jackets. But with apologies to Sergei Bobrovsky and Zach Werenski, the biggest story in Columbus has been the power play. And it's a virtual certainty that that unit will be coming back to Earth soon. Right now, the Blue Jackets' power play is clocking in at a 27.7-percent success rate. Only one team in NHL history has finished with a higher rate over a full season, and that was back in the high-flying ’80s when everyone was filling the net against tiny goalies who hadn't figured out the butterfly yet. Wayne Gretzky's Oilers never had a 27-percent power play. Neither did Mario Lemieux's Penguins or Mike Bossy's Islanders. But we're supposed to think that Nick Foligno's Blue Jackets have figured it out? Not a chance. This is a classic case of a decent unit hitting a hot streak for a few weeks, and once it regresses back to where it deserves to be, this team will look very different. Yeah, but: Plenty of smart people have been studying the Blue Jackets' power play to try to figure out what makes it tick. And they've been finding some interesting things, including a five-man first unit that's doing an excellent job at consistently generating high-percentage shots from dangerous areas. Sure, there's clearly a degree of good luck happening here; nobody thinks that the Blue Jackets have suddenly cracked the code on 100 years of power play strategy. But the top unit isn't simply succeeding based on a fluke; they've been earning it. And even if you don't buy any of that, let's not overestimate the impact that the Columbus special teams could be having. If they were hitting at a league-average rate of 18 percent or so, their 23 power play goals would drop to 15 or so. That's eight goals, which conventional wisdom says translated to one or two wins. That's nothing to sneeze at, and it's possible that Blue Jackets' power-play prowess is even more important because it's forcing teams to play them differently at even strength. But it's not enough to make the difference between them being an elite team and an also-ran. Even if the power play settles down, this still looks like a strong team.